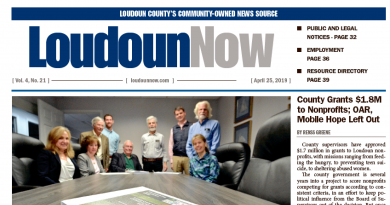 A half hour before the Loudoun County School Board meeting started Tuesday, all 844 seats in the boardroom and an overflow room were filled. 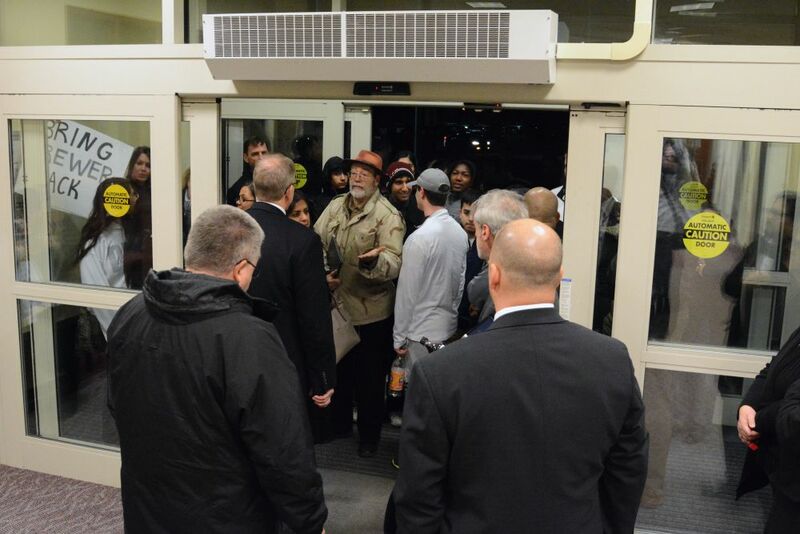 Speakers continued taking their turns at the mic well past 10 p.m.
Few board meetings, if any, have drawn so many upset parents, students and staff members. 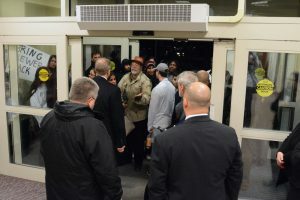 The vast majority were there to formally protest a recommendation by Superintendent Eric Williams to terminate the employment of John Brewer, principal of Dominion High School since 2003. The former Loudoun Principal of the Year award winner has been on leave for the past six weeks. School system administrators have declined to specify why Brewer is on leave, but the move came as Loudoun County Sheriff’s Office launched an investigation of Brian Damron, who served as Dominion’s band director from July 2012 to January 2015 under the leadership of Brewer. School records show that Brewer wrote a letter of recommendation for Damron that the band director submitted to Duval County Public Schools in Florida, as part of his application. Damron was later accused of making sexual advances toward a 15-year-old student there. No charges were filed, but the band director has since resigned. Loudoun County Sheriff’s Office’s investigation is ongoing and is looking into whether any criminal activity took place in Loudoun. LCPS Music Supervisor Michael Pierson also wrote a letter of recommendation on Damron’s behalf, according to records from Duval County Public Schools. He has not been placed on leave, according to the school system’s Public Information Officer Wayde Byard. 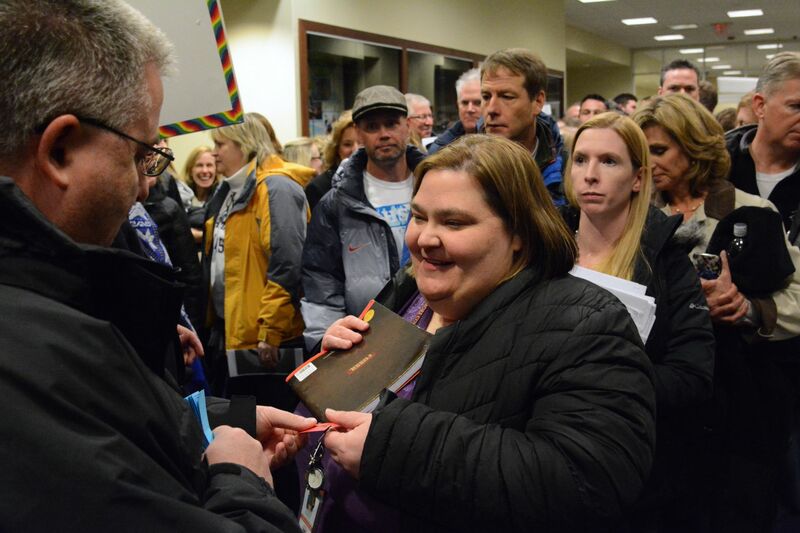 In an unprecedented outpouring of support, close to 200 speakers Tuesday night described Brewer as the best educator and mentor they have ever known. They recounted stories of the principal buying yearbooks and game tickets for students who couldn’t afford them. They said he lent his family car to a pregnant student so she could attend doctors’ appointments. Library assistant Esther Kim told the board how Brewer supported her after her husband’s death, and even served as a pallbearer. “Dr. Brewer is the kind of principal I have found washing dirty dishes in the staff lounge alone, with no expectation of thanks,” Dominion English teacher Amy Secrest said. The board did not make a decision on Brewer’s employment Tuesday. If Brewer, as expected, appeals Williams’ recommendation, the matter goes to the School Board. The School Board can choose to have an independent hearing officer review the information and make another recommendation to the School Board, which makes a final decision, according to school division counsel Stephen DeVita. Any discussion will take place in closed session because it is a personnel matter. 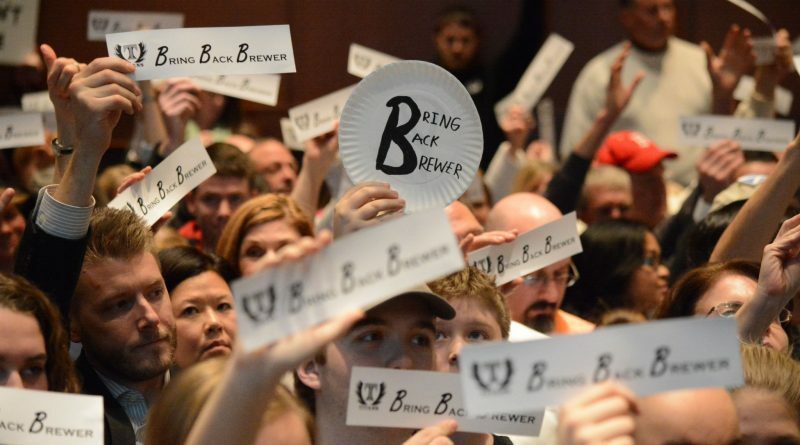 Debbie Rose (Algonkian), who confirmed last week that Brewer had been recommended for termination, said in an interview that, for that same reason, she cannot comment on the details of the situation. “I’m not going to say anything, not yet,” she said. Dominion teachers also held a demonstration in front of the high school Friday morning, after they had heard of the plans to fire their principal. 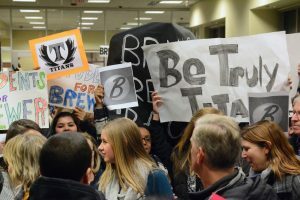 About two dozen school staff members gathered in front of the school dressed in black—the school color—adorned bike helmets, and waved signs penned with pleas to reinstate Brewer as the school’s principal. The bike helmets were a shout out to Brewer, who often rode his bike. A fundraising page at gofundme.com/support-dr-brewer was launched late last week to raise money for Brewer’s legal defense. The site says, “Dr. Brewer intends to vigorously defend his position, and has retained counsel to represent him.” As of Tuesday evening, it had raised $21,575. A petition at Change.org in support of the principal has more than 2,665 signatures. No, they did not. There was nothing about students or bathrooms in the proposed change. They voted against adding language to protect LGBTQ employees from being discriminated against. Your comment accomplishes nothing except to demonstrate how desperately we need to add these protections.